Above, the proposed FEMA building and performing arts center and the new preschool classrooms and music room on a Purdy campus map. The Purdy R-II School District is requesting a $2.3 million bond to build a tornado shelter with the aid of FEMA grants. The bond measure will appear on the August 2, 2016, Primary ballot and the measure will not require a tax increase for citizens. Purdy voters are being asked to approve the issue, allowing the school to utilize a portion of their debt capacity to acquire a bond. If the bond passes, there will be no additional taxes for Purdy School District residents, but rather it will allow the school to borrow the funds to get the tornado shelter constructed. The plan for the shelter shows the building at around 8,000 square feet, and it will be able to house around 1,300 in the event of an emergency. If school is in session, the facility would be open on campus, however, since FEMA is involved, residents that live within a certain area near the shelter will also receive a letter if they are in the evacuation area in the event of a major storm. The FEMA grant for the building will cover 75 percent of the base costs of a storm shelter, however, the school wants to use the additional funding to make the building more multipurpose. Instead of a “box,” the building will be converted into a dual purpose storm shelter and performing arts center. The bond will also make it possible to have a new preschool, new parking and a new band/choir room. It is yet to be determined what the seating capacity of the performing arts center will be until plans are finalized. 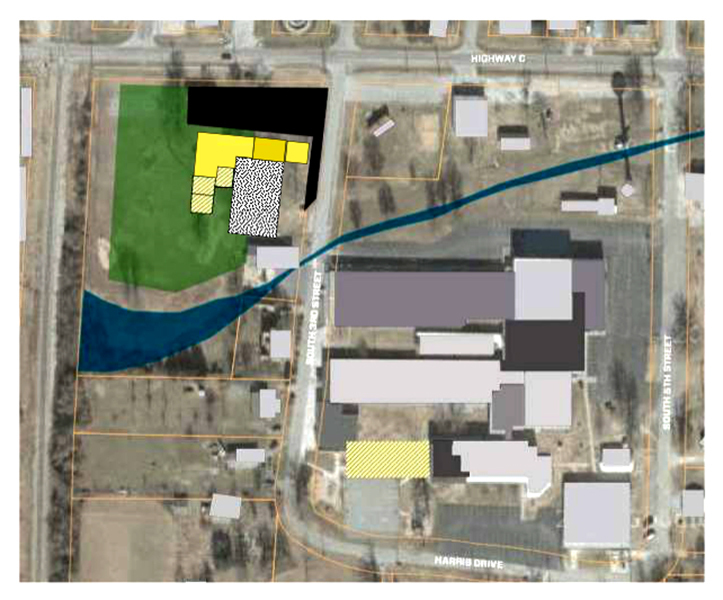 The building is to be constructed in the open area between the playground and existing preschool with the lobby facing Highway C.
While there is not a set time line for the project, it will happen if the bond is successfully passed and the FEMA paperwork is approved. The school anticipates a six-month construction window once the project formally begins. Other schools in the district have undertaken similar projects in recent years. Cassville Schools has two FEMA shelters, one near the elementary, intermediate and middle schools, and one near the high school. Wheaton voters passed a bond measure to build a FEMA shelter earlier this year in April with funds anticipated to be distributed in August. A ‘yes’ vote will allow the school to take out a bond for the project, and a ‘no’ vote will deny the school to take out the bond. No taxes are anticipated to be raised with the measure. Absentee voting for the August 2 Primary is currently open and will close Monday, August 1. The polls will be open for voting Tuesday, August, 2, 2016, from 6 a.m. to 7 p.m.
For more information on the issue, go to: https://sites.google.com/a/purdyk12.com/purdy-bond-2016/. The website also has a list of business and community partners who endorse the project that is being updated regularly. School representatives will be available on Saturday, July 16, at the Purdy Festival to answer questions about the measure.